The United Model 5400 and 5450 Vertical Post Indicators are UL Listed / FM Approved. They are used to identify the position of buried Gate Valves (Post Indicator Valves) and are recommended for use in fire protection piping systems. Each unit consists of four components, the Post, Telescoping Pipe, Base, and Stem. 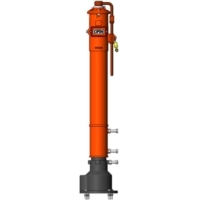 The Model 5400 is universal, and it is adjustable to accommodate valve bury depths from 3 feet to 15 feet. 1. Indicates if the valve is in the open or shut position. 2. 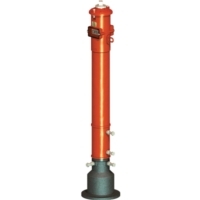 The indicator post provides a means to operate a buried or otherwise inaccessible valve. 3. The adjustment range of the indicator post is 34.5” to suit the deeper buried valve and can be easily adjusted in the field. 4. The wrench handle fits over a “U” bracket on the barrel, and may be fixed with a padlock to secure the operation wrench to the barrel. 5. Model 5400 for valve sizes 3"-16". 7. UL Listed - 4"~12"/ FM Approved - 4"~14"